What the heck is going on with Intellicell Biosystems, Inc. (SVFC, also SVFCE), a stem cell corporation run by Dr. Steven Victor? Why are some on Wall Street seeming so bullish on the company lately? What’s the real story and the facts? What is the key background on this company? Wall Street has been buying and selling this stock in a frenzy of activity pushing volume up dramatically (see bottom chart above from wallstreetnewscast.com) in the last month even as the company has faced mostly bad news from my view and a collapsing stock price (upper chart). An example of the bad news is that Intellicell has had to deal with some litigation (more here) and has in addition been facing FDA scrutiny including a serious action called an “FDA warning letter”. More recently, Intellicell was reportedly again inspected by the FDA in May-June of this year. About a month ago, I contacted Victor to ask for the release of a recent FDA inspection report of Intellicell or to see if he’d answer some questions, but he did not reply. While the price per share (PPS) has fluctuated day-to-day a great deal, overall it has not substantially recovered from a broad perspective. For the past 12 months, the stock PPS has tanked, down more than 6-fold. Investors in the company in some cases have lost a lot of money. However, over the last month the stock has bounced up somewhat, up 2-3 fold (although down a great deal the last two days). This seems like very enthusiastic talk considering the overall picture for Intellicell is quite complicated. That sounds like company boiler plate verbiage to me. In fact, the question of whether Intellicell’s product is compliant with the FDA’s minimal manipulation definition seems, at least based on publicly available information, to be far from resolved. It is quite possible the FDA will determine the product is more than minimally manipulated. Update: I would also note in regards to the issue over whether Intellicell’s product is a drug/more than minimally manipulated that in the FDA warning letter last year to the company, the FDA stated that Intellicell’s product was a 351 drug and was more than minimally manipulated. It is also not at all clear that the FDA will view the use of the Intellicell stem cell product as homologous use. Thus, in my opinion, Kolbert’s statements about Intellicell seem too cheery and could end up being flat out wrong. We just don’t know. That is a big can of worms. You see, the FDA has defined SVF as more than minimally manipulated (aka a drug; see actual FDA letter to address this question at the bottom of the page at this link)) and that would suggest that Intellicell’s stem cell product is a drug, which could be very problematic for the company, which argues its product is not a biological drug. It seems that the eventual release (hopefully sooner rather than later) of the most recent 2013 FDA inspection report will tell us a great deal about where this company really stands and the prospects for the future. Disclosure: I have no financial interest in Intellicell. 1. 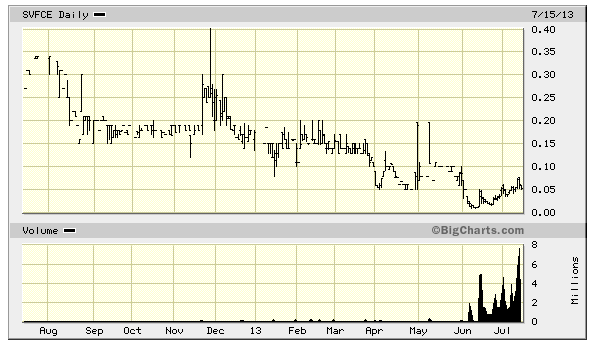 Penny stocks are often heavily traded and manipulated for reasons which have very little to do with the company. 2. While I don’t know, it is possible Kolbert’s view of the $SVFC is being sifted through the lens of a financial relationship with the company. 3. I agree with your statement that “the question of whether Intellicell’s product is compliant with the FDA’s minimal manipulation definition seems, at least based on publicly available information, to be far from resolved.” I disagree with your statement that “the FDA has defined SVF as more than minimally manipulated”. I believe most industry insiders and analysts are cautious to extrapolate too much from the FDA’s response to one request for designation. While many believe the FDA is certainly leaning toward enzymatic digestion as constituting more than minimal manipulation this has not yet been clarified and Intellicell’s process likely looks quite different than Rodriguez’s process. Thus one must be very cautious about over-interpreting what the FDA did or did not say in such instances. Thanks for the comments, Lee. Regarding #1, I think something odd is going on with the trading here the last 1-2 months given the very abnormally high volume. I’m not a stock expert, but it sure seems unusual and seems to coincide with some market analyst comments. Regarding #2, you may be right.There sure seemed to be some corporate boiler plate-like stuff in his statements. Regarding #3 and SVF specifically, we disagree. If you read the FDA warning letter to Intellicell, it says their SVF is a 351 drug and the use is non-homologous: http://www.fda.gov/ICECI/EnforcementActions/WarningLetters/2012/ucm297245.htm. So I disagree with you. Also, it seems our opinions diverge more broadly regarding SVF. I think SVF is most safely assumed to be a 351 and companies that believe differently would be very wise in my opinion to seek FDA guidance before administration to patients based on a potentially incorrect assumption that they are dealing with a 361. The clinical use of SVF based on the latter 361 assumption has, in my opinion, gotten way out of control. You are right that the FDA has opined that “tIntellicell’s SVF does not meet the requirements to be eligible as a 361. It is also true that FDA designated the Rodriguez SVF as a 351 based on the information provided. While this starts to look like a trend it is important to note that this is nothing more than 2 letters from the FDA about 2 specific products. The FDA has to-date refused to state (as clearly as you did) that all SVF will be considered more-than-minimally manipulated regardless of how it is processed. Given the decisions to-date, you are certainly right that companies and physicians should certainly not blithely consider SVF to be minimally manipulated. Indeed the weight of the evidence appears to be tipping to the contrary but it does remain an open issue on which the FDA has not expressly ruled or provided general guidance other than seemingly what insights might be gleaned or inferences drawn from the response to the Rodriguez request for designation and the warning letter to Intellicell about the specific SVF-type products which were the subject of those letters. I don’t think we should confuse Wall Street with wallstreetnewscast.com. When one mentions the former, we think of the very large stock brokerage firms/investment banks, the NYSE, NASDAQ, the huge commercial banks and the foreign offices of the multinational/international foreign banks. ‘wallstreetnewscast.com’ seems to be a promotional vehicle for penny stock brokers who focus primarily on microcap companies in the resource and biotech sector listed on the OTC markets with varying degrees of disclosure (or lack thereof) ie. Intellicell (SVFC). I don’t know much about Maxim Group, but they are not in the same league as the big boys on Wall Street, nor are they a mid-size brokerage with a ‘buy-side’ analyst mentality and institutional clientele. They would probably be considered by the larger institutions as a ’boutique’ sell-side firm specializing in microcap stocks. In summary, its a big stretch to assume that a few choice remarks in a report by the Maxim Group represents “Wall Street” bullishness in any way. Note that in that report by Jason Kolbert, he does NOT rate Intellicell a ‘buy’ as he does other companies in the report. That fact says a lot about the analyst – he may not be willing to ‘put his money where his mouth is’. …as I have said many times before, the use of the word “homologous” as it relates to SVF is almost impossible to define. SVF components are derived from blood vessels in the organism regardless of the actual source. Lipoaspirate is convenient with the rich vascular networks that surround adipocytes. FDA has used template language with almost every response they have made to various companies and it is not well thought out in regard to 361 versus 351 and what is defined as “minimal manipulation”. This is the crucial point on this part of the argument. Laboratory compliance with cGTP requirements is the second. Robert Sexauer, aren’t you the Executive Vice-President of Intellicell BioSciences? Do you have any comments that may enlighten us as to the greatly increased trading in the company’s shares once they dropped below 5 cents a share? And why did the company recently issue over 31 MILLION shares to settle an $800,000 debt to a company that bought a default court judgement against Intellicell? Why didn’t Intellicell just pay their debts in cash instead of diluting the share capital by over 30%? SVFC has not issued a quarterly report since November of 2012 (for the quarter ending Sept 2012). No wonder – the firm had a default judgement issued against them in favor of Sherb & Co, an accounting firm, for the amount of $88,000. Yahoo finance gets its information on shares issued and outstanding from SEC filings. Old statements equals old info. In early 2012, Dr. Victor increased the authorized share capital to 500,000,000 shares, and since then, the issued and outstanding is well over 100,000,000 shares. (You have to piece this info together from whatever info the company choses to file with the SEC – that’s why they are BACK on the pink sheets where they started – lack of financial disclosure). With a share price of around 5 cents, that puts their market capitalization at just over $5 million. This may be why Jason Kolbert cannot put out a ‘buy’ recommendation on the company – no sane analyst would put their reputation on the line for a company that cant issue current financial statements and has been sued for lack of payment from their former auditors. Collateral: All Assets of IntelliCell BioSciences. Inc.
What the heck is going on with Intellicell (SVFC) over on Wall Street? Massive volume.